I work on two separate family trees. The first is my official tree, maintained on Ancestry.com and in Family Tree Maker, that contains all confirmed relationships. Everyone in this tree is somehow related to me, although some relationships are through marriage to a blood relative. And in very few cases, there are some branches who I am sure (at about a 95% level of confidence) that there is a relationship — someone is noted as being a “cousin” — but I haven’t found the missing piece to tie that household into the larger picture. I use this tree to store information that might eventually lead me to discovering a connection. Here is one example. It is family lore that my paternal ancestors — the Landes family — emigrated out of Romania in the late 19th century, traveled across Europe, made their way to England, and departed over the Atlantic Ocean to North America. Along the way, some Landes family members settled in locations throughout Europe. Two Landes family members from Romania appeared in the London area around the same time that my second great grandfather, Moses Landes, was passing through on his way to Canada and New York. Jean Landes (1860-1943) married Bertha Reicher in about 1887 in England. Jean was born in Iași, Romania. They had three children, Henry, Frederick, and Ruth. The family moved to New York, but Frederick returned and married Mildred (Minnie) Surfin. Also in London, the Sufrin family. According to Jean’s death certificate, his father’s name was Abraham and his mother’s name was Natalie. Natalie is not a likely Jewish name at the time — maybe it was Nettie or Ethel. Before Jean Landes’s family moved to the United States, they lived close to another Landes family from Romania, headed by Max Hersch Landes (c1852-1922) Max Hersch married Rachel Finestone, while Max’s sister Netty married Rachel’s brother Julius. Max and Rachel did not appear to have any children; Julius and Netty had a daughter, Gertrude Finestone, who died unmarried in 1927. I have two segments of Landes families living in London at the turn of the 20th century, and because records from Romania are not online, I haven’t been able to whether and how these pieces fit together. But at some point, more records from Iași will be online. By keeping track of my findings so far, even though there’s no confirmed relationship yet, will save me a significant amount of time later on if I can eventually find a connection to the various Landes branches leaving Romania. In addition to Jean and Max Hersch, there have been other Landes households from Romania or Russia living in New York. 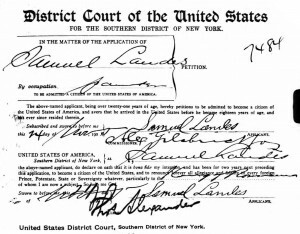 Samuel Landes (1883-1964), the son of Abraham Landes and Scheine Leah, was born in Iași and married Frieda Schatz. They had seven children: Alfred, Augusta Theresa, Edith, Mae, Isadora, Esther, and Joseph. They lived in Manhattan, Queens, and Brooklyn. Could Samuel be a brother or half-brother of Jean Landes, whose father was also named Abraham? Could Samuel be the Sam Landes who was listed on Moses Landes’s ship manifests from England to Montreal? Joseph Landes (1873-1945), the son of Yitzchak Yehuda Landes, was born in Russia or Romania (most likely the Bessarabia region) and married Frieda Feuerstein. They had ten children: Harry, Joseph, Isadore, Meyer, Rebecca, Nathan, Sidney, Fanny, Abraham, and Isaac. The family resided in and around New York City before several of the children moved away from the family center. For another interesting connection with this family, two of these Landes children, Isadore and Rebecca, married two Hershenovs, Minnie and Joseph. 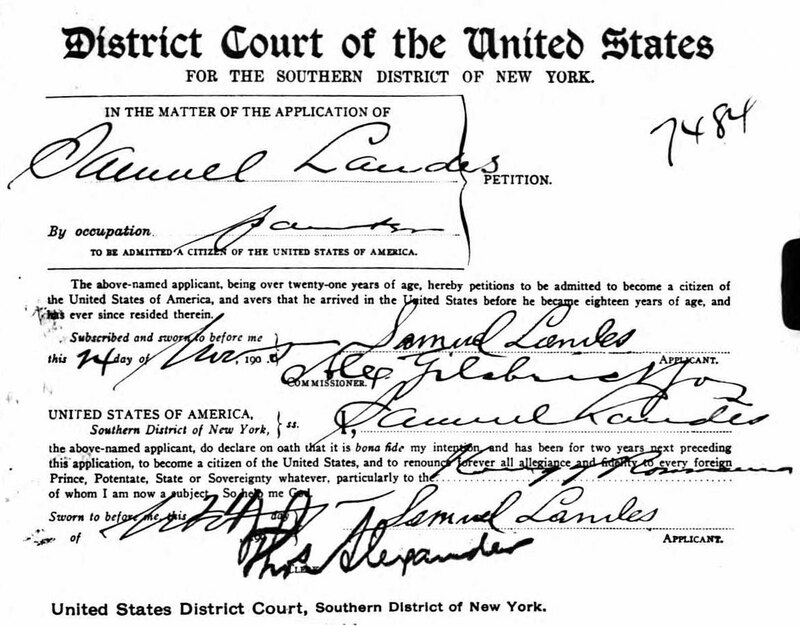 My great grandfather and third great grandfather were also named Joseph Landes, as were many other Landeses in New York. Lena Hershenov — perhaps a different branch of this Hershenov family, but I haven’t been able to confirm that yet — married Jacob Margareten. Jacob appears in my confirmed family tree as the father-in-law of the stepson of the stepdaughter of my second great grandmother. It’s not a real family connection to me, but if Lena is related to Rebecca and Joseph, it would bring Joseph Landes’s branch of the Landes family into my family tree in one location. There are other Landes households who lived in Romania in the latter half of the 19th century, and I’m passively tracking them in my “research only” tree. I’m doing the same for the Kashowitz families that lived in New York in the 20th century as I try to find a connection between them and Rebecca Kashowitz, my second great grandmother. The drawback is that there is not enough time in one person’s life to research all of these tenuous but somewhat likely family connections. Normally, the research I’ve done is from the inside out — I start with confirmed relatives and expand the families outward as I find new information. This process of researching from the outside in — starting with likely relatives and using new information to, I hope, get closer to my confirmed relatives is more difficult and time-consuming, but it can be rewarding in the few cases where I do find that missing link. Otherwise, reverse research can be a huge waste of time. At least I can share information I’ve found with other researchers who are in fact related to these individuals, and someone might be able to benefit from the time and money I spend looking through information and purchasing copies of records.